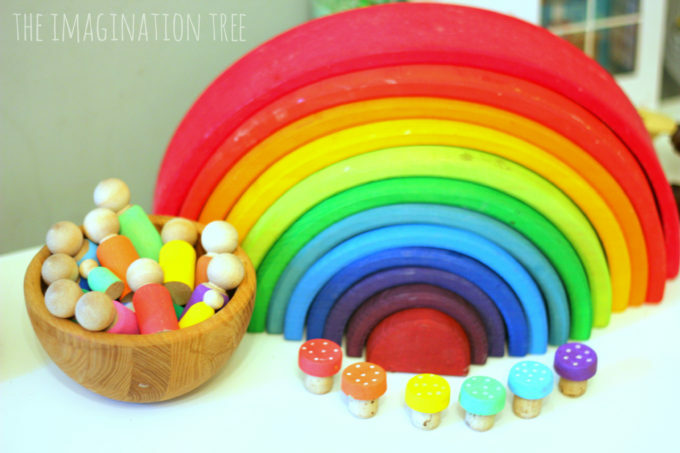 Make some DIY rainbow peg people and toadstools too for imaginative play, counting and storytelling. 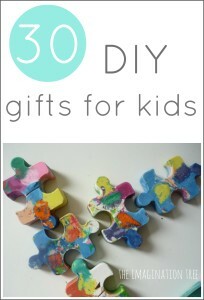 These are a perfect homemade gift for preschoolers or to make for a classroom resource. SO easy too! 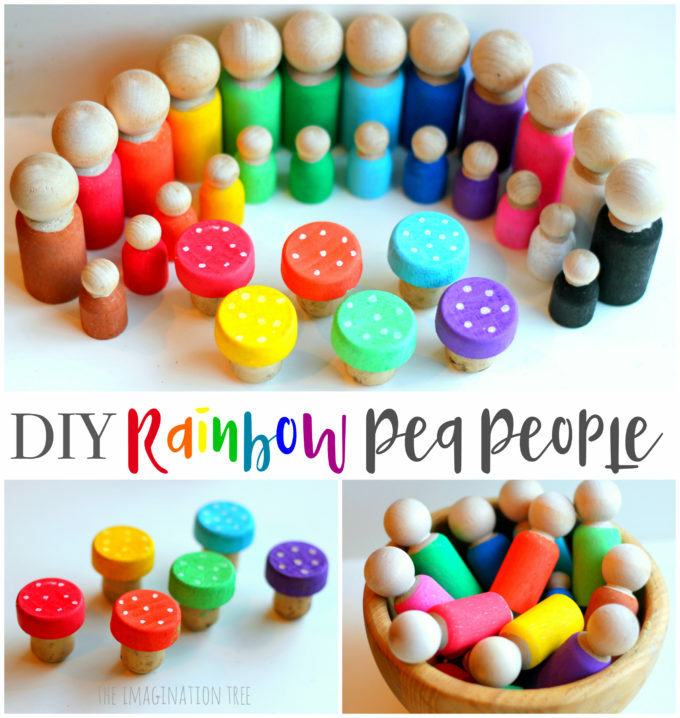 A few years ago I made the kids a set of rainbow fairy peg dolls which they’ve loved and used often in their small world imaginative play scenes. 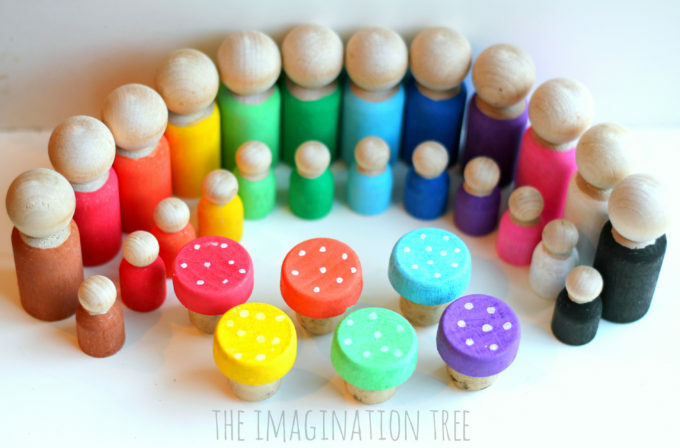 Earlier this month I made a new, much simpler set of DIY rainbow peg people, this time as a gift for Mr 2’s birthday. 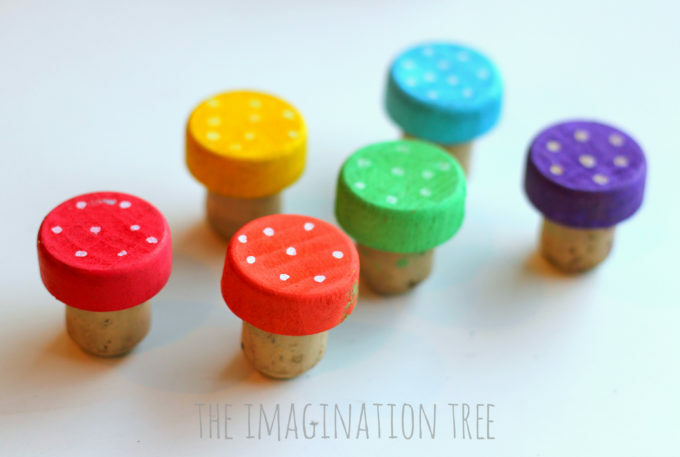 To match the peg people I also made a set of rainbow toadstools using corks, which are super cute and very easy too! 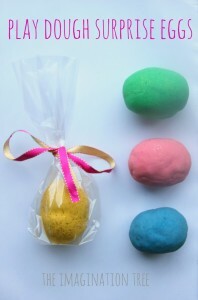 Posca paint pens are excellent and are the same ones we have used for these DIY Alphabet and Number Rocks. I love how the nib is still fine so that the ink is controlled. Of course if your peg people are bigger then try using acrylic paint with a thin paintbrush too for quicker completion. 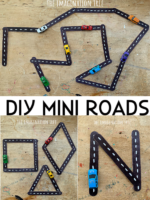 These are so simple that they barely call for a DIY tutorial at all, but hopefully the photos and links to find the materials are a good starting point and help for you! 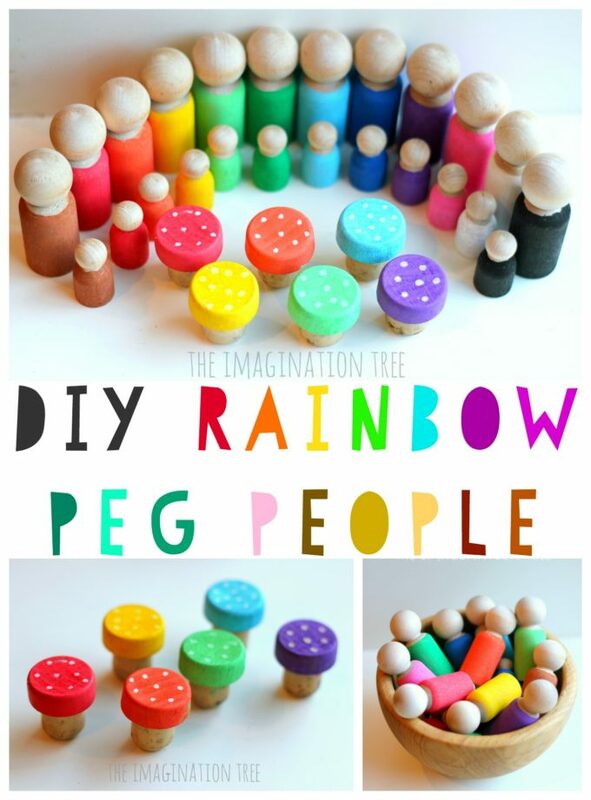 Simply choose which colours you want to make and draw onto the peg people. I decided to make an extended rainbow and black, white and brown too, and love how that introduces the possibility to sort them into warm and cool colours, family groups and more. 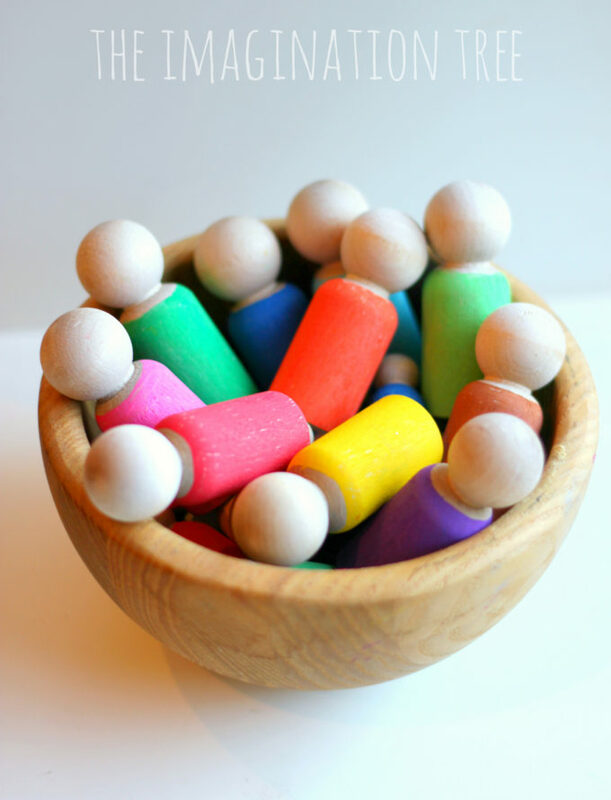 I also could NOT resist the adorable tiny baby version of the peg dolls, so coloured a baby to match each parent. The kids absolutely loved these and immediately created families and backstories for them all! 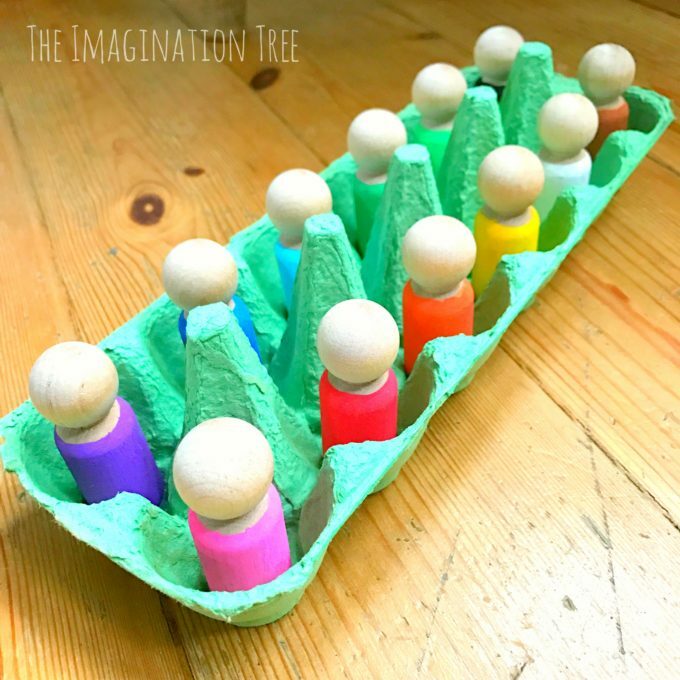 Mr 2 plays differently with the rainbow peg people, enjoying adding them into an egg carton using 1:1 correspondence and putting them in his cars and trains for a ride! There are plenty of ways to play with open-ended loose parts and materials. Leave them at an accessible place on open shelves and watch the play unfold! See many more of our DIY TOYS here! 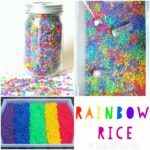 Check out loads of RAINBOW themed play and learning ideas here! « Kind Words Challenge with The Kindness Elves! Hi, what a great idea! My kids will love these. What type of paint did you use? Is it safe for toddlers who occasionally put things in their mouth?